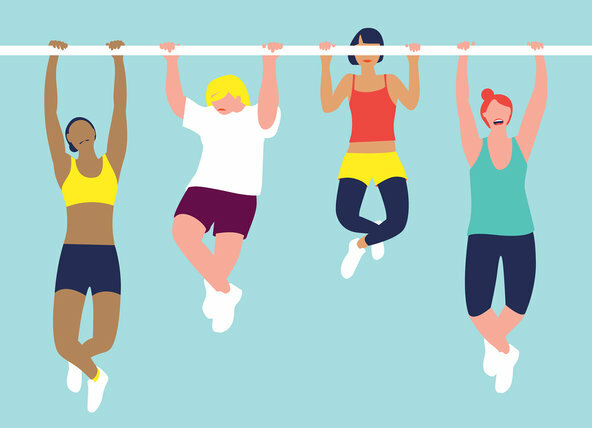 While the pull-up has been used by everyone from middle-school gym teachers to Marine drill instructors to measure fitness, the fact is that many fit people, particularly women, can’t do even one. To perform a pull-up, you place your hands on a raised bar using an overhand grip, arms fully extended and feet off the floor. (The same exercise, performed with an underhand grip, is often called a chin-up.) Using the muscles in your arms and back, you pull yourself up until your chin passes the bar. Then the body is lowered until the arms are straight, and the exercise is repeated. The Marines say a male recruit should be able to do at least 3 pull-ups or chin-ups, but women are not required to do them. In school, 14-year-old boys can earn the highest award on the government’s physical fitness test by doing 10 pull-ups or chin-ups: for 14-year-old girls, it’s 2. To find out just how meaningful a fitness measure the pull-up really is, exercise researchers from the University of Dayton found 17 normal-weight women who could not do a single overhand pull-up. Three days a week for three months, the women focused on exercises that would strengthen the biceps and the latissimus dorsi — the large back muscle that is activated during the exercise. They lifted weights and used an incline to practice a modified pull-up, raising themselves up to a bar, over and over, in hopes of strengthening the muscles they would use to perform the real thing. They also focused on aerobic training to lower body fat. So no matter how fit they are, women typically fare worse on pull-up tests. But Vanderburgh notes that some men struggle, too, particularly those who are taller or bigger generally or have long arms. This is related to an interesting phenomenon: if you compare a smaller athlete to an athlete who has the same exact build but is 30 percent bigger, the bigger athlete will be only about 20 percent stronger, even though he has to carry about 30 percent more weight. Ha, so according to Tara Parker Pope, when it comes to pull-ups, good things come in small, fit, packages. Perhaps it’s just my genetic destiny that pull-ups and chin ups have never been a big deal to me – it’s like I never grew out of them from when I was a kid. Whatever the reason, I do dig ’em – I like the feeling at the top of being way up there in the air, far closer to the gym’s ceiling than I usually hover – even if I have to suffer stares and comments from guys at the gym who are somewhere between impressed and frightened when I do a few sets. Is it really such a spectacle to see a woman on the chin-up bar? Bottom line, ladies, is this can be done, by you, too (Tara Parker Pope notwithstanding.) There is an expectation of failure when it comes to women and upper body strength, and I’d like us all to think twice about this. Pullups and chin ups are amazing for your upper and lower back, lats, biceps, shoulders, abs and pectorals, and they’re a great part of a workout. They get your heart rate up in 2 seconds and you’ll feel like Demi Moore as G.I. Jane. Or better – you’ll feel like Rocky. And you know that jiggly under-arm flab that tends to make women say no to tank tops and tees? Do these and squishy arms will be not apply to you. « Want to feel really good? Sing! Very interesting when investigating the reasons why women aren’t typically as good as men when doing pull ups. There are several reasons why that is the case. Most women are at a mechanical disadvantage compared to men because their center of gravity is lower on the there body due to the fact that they are birth bearing creatures:) Also, men may have a slight advantage because they are able to recruit more motor units to facilitate the task. The more muscles and motor units one can access- the easier one can execute the task of a pull-up. If one truly desires the ability to do pull ups, they need to practice the pattern of doing exactly that. One may want to start with hanging, in order to build the necessary muscular endurance to hang for long periods of time. Or hop on an assisted pull up machine to practice the overhead pulling pattern with assistance pushing you back up to the starting position.